The Elite Concert Tambourine: offers up two staggered rows of jingles so you get extra resonant tone. The full circle tambourine provides easy grip and playability with its smooth hardwood frame. Slap and tap on the natural goat skin head for beautiful tone. Shekere: The Fiberglass Shekere is an outstanding instrument featuring a precision formed, traditional shaped, fiberglass shell for increased volume and projection. 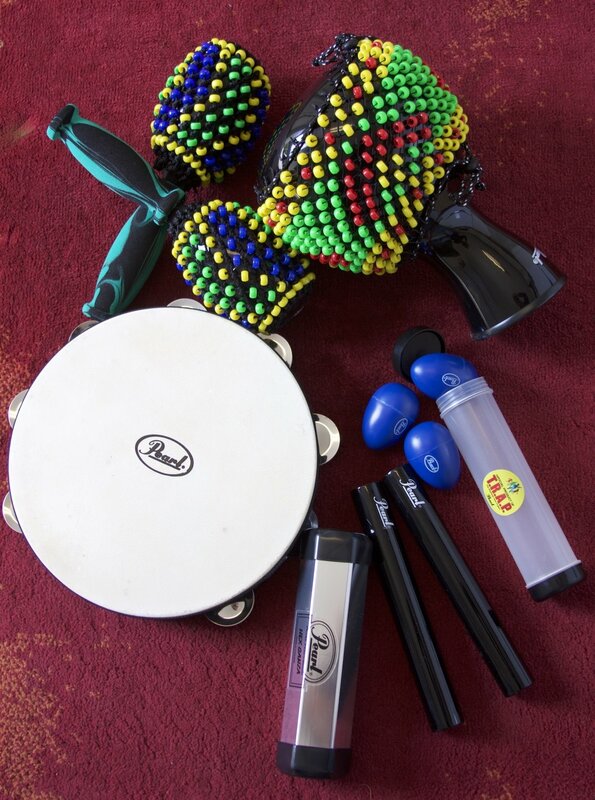 It is about half the weight of traditional Shekere’s and has adjustable tension beads allowing you to vary the sound. Beaded Maracas (2): Shekere-style exterior beads on a fiberglass body that produce an excellent sound with great control. Fiber Clave-sticks (2): produce a cutting clave sound and, unlike traditional Rosewood designs, never shift in pitch and are virtually indestructible. Hex Ganza: Aluminum Hex Ganza is a uniquely-shaped shaker that produces three separate sounds by simply shaking it in different ways. Egg shakers (3); The Pearl Egg Carton features three egg shakers in a translucent tube. The eggs can be played separately or all packed in the carton as a complete unit and played. The Percussion Pack comes with its own unique carrying bag for easy transport and storage.